Ukmo but mainly because it goes no further than 168 hours. 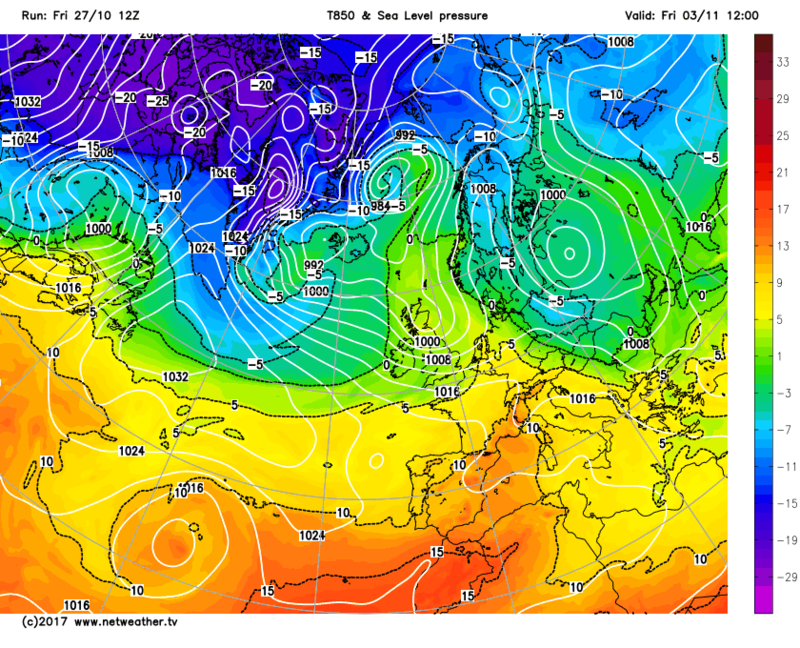 Much more seasonal weather coming up.Maybe some frosts and Northerly outbreaks on the cards as we enter November. Yes it always seems to be the case year after year. It does make me wonder why this happens and if it would be possible for the models to be tweaked to correct this? Height rises around or towards Greenland should always be viewed with a very sceptical eye until they get within at least 120hrs - probably less. That way you save yourself a lot of disappointment. 6z not quite so bad. Weakish UK heights sort of holding on. Yes is odd, though what is weird is that we have seen the height rises in Spring and Summer. 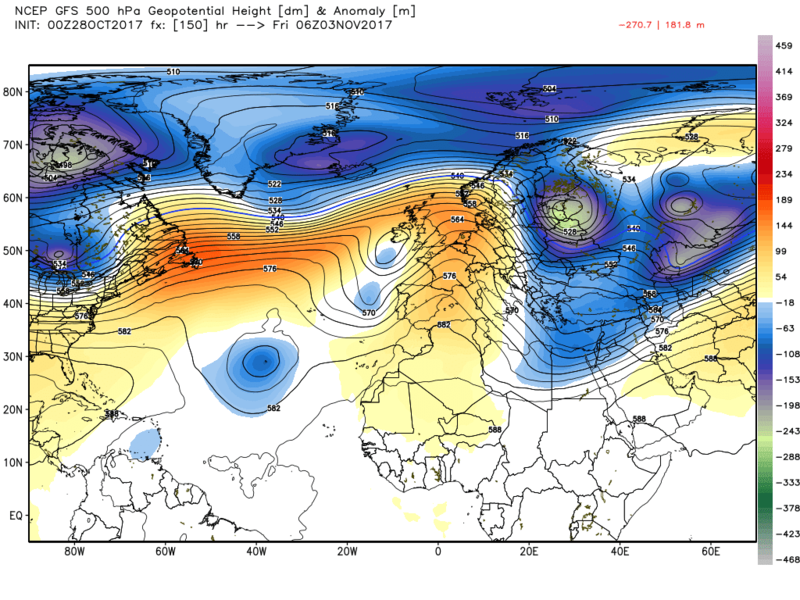 Weakish UK heights sinking to where it always likes to set up...and on the 06z to our south and then to the east. 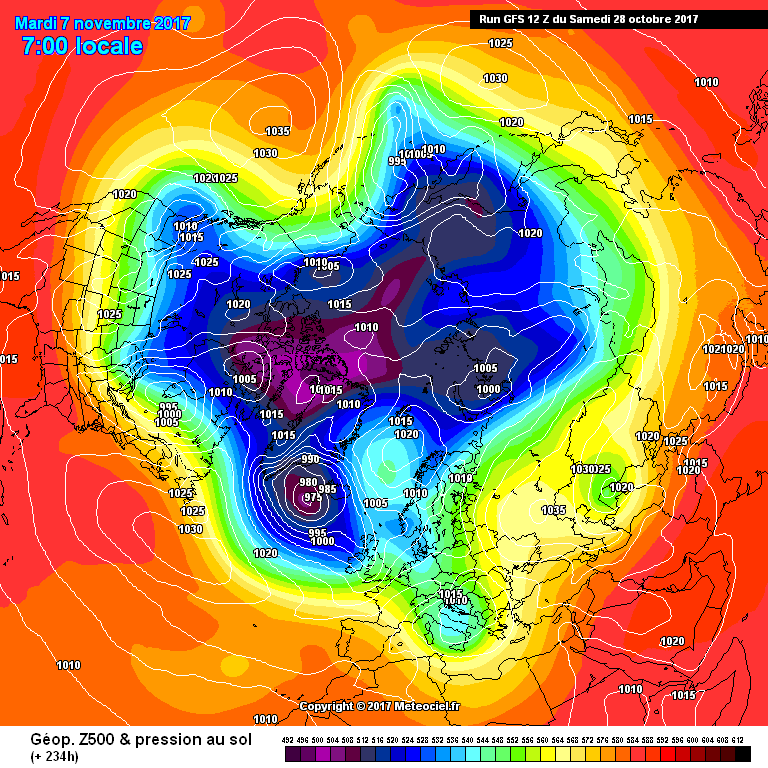 Only straw to grab at is Europe goes quite cold for a period and in the longer term it 'might' does us a favour if we can ever get hold of an easterly over winter. That continent needs to cool down. I was making posts about MJO on Wednesday, talking about the forecast for it. But I have had another look at MJO and all of the equatorial waves. I think probably because spring and summer see the polar vortex disappear,hence the more northern blocking. To be honest, the 06Z OP continues to pique my interest. 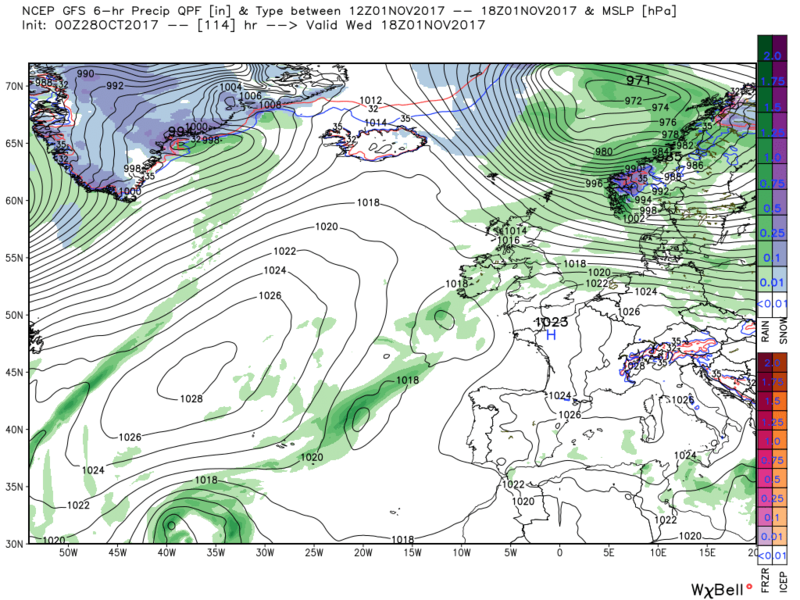 The core of the HP remains well to the NW of the Azores even in far FI while the jet ridges round the mid-Atlantic HP and then SE over the British Isles. What we aren't looking it is a long spell of tropical maritime air sourced from the Canaries or points further south or south west. The airflow is more west or even WNW at times so from south Greenland so a more seasonal temperature profile than in previous years for the first third of November. 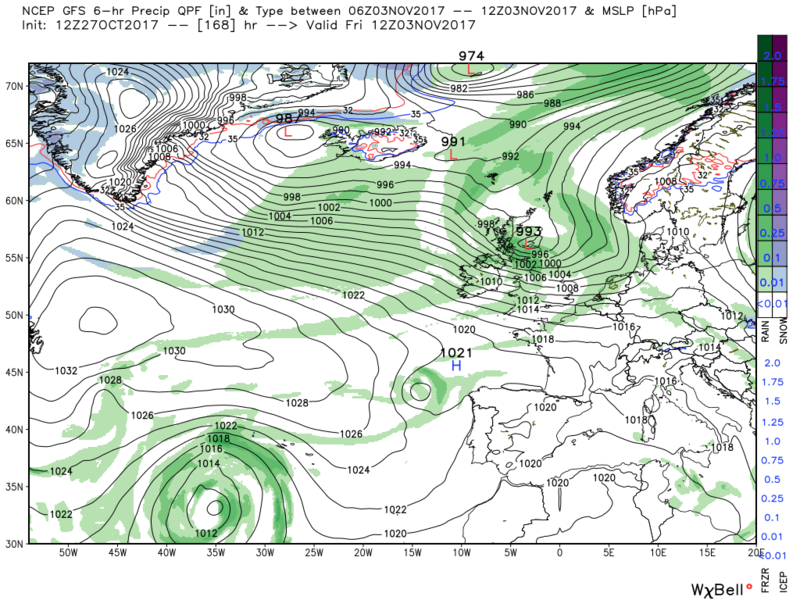 It's also worth noting no strong signal for cyclogenesis with the Atlantic not overly strong so no autumnal storms at this stage - indeed, quite benign in the next week and we might see a bit more fog than we've had in previous years. All in all, at this stage, a more "typical" early November. It means nothing for the rest of winter. Is that the Pacific ridge you are alluding too? If so, then I certainly agree and don't quite get why people will be excited by this as I think the effects of cold weather on a UK perspective is quite minimal, yes the PV becomes disorganised but its useless for us if it does what you say it does and most of it heads into Canada and down the eastern seaboard and the other half heads into China leaving the UK and Scandinavia quite mild and deep cold air looking very far away from our shores. 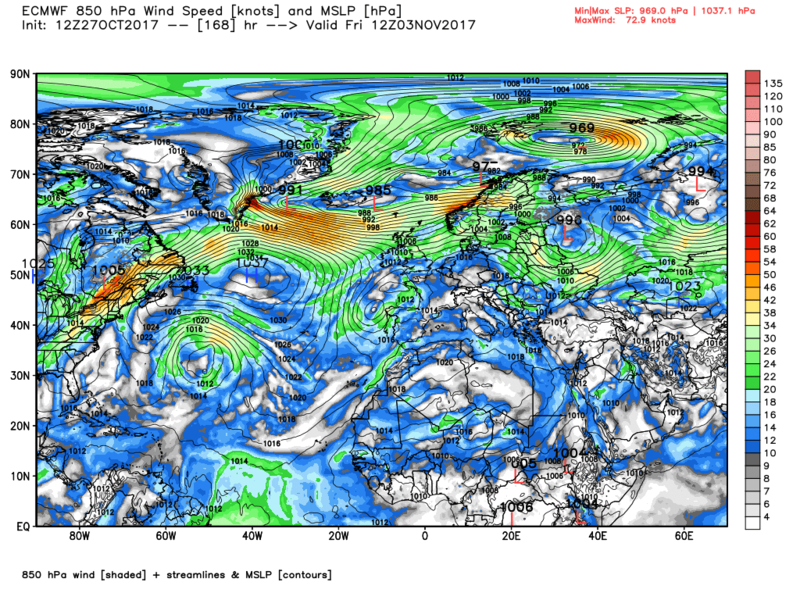 Of course, if the WAA heads up to the poles from the Atlantic side of the Arctic then things get more interesting as the PV will split into Scandinavia/Russia and Alaska and it suggests blocking over Scandinvia. All that said though, the Arctic is too warm as it is and I don't see any benefits of a disrupted PV this early in the season and I rather see a rampant PV and stormy weather seeing as its still Autumn afterall, Sadly that is not the case at the moment as it look like we will be under the influence of fairly slack westerlies and fairly mild air so rather uninteresting outlook, not quite seeing much signs of a cold/dry start to November either really, if we get more amplification then maybe but most runs I seen dom't seem to back this up. 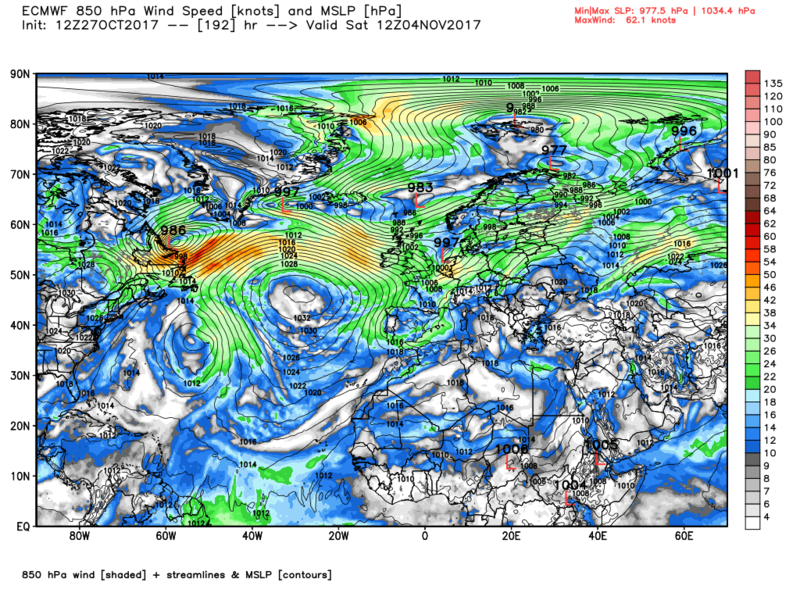 I think the models struggle with the recent set up of less ice around Greenland. This feeds shortwave activity in the area and the height rises that are shown 10 days away get downgraded as we approach T0. Maybe they will improve over the years as more data is fed into the models. Basically, I think the models often show what could happen if there was more ice in the arctic and in particular around Greenland but sadly that's not what we have. I thought the whole idea of computer modelling was to factor in all those different parameters? I for one think they are all useless and strangly seem to be getting more so. Would it not be easier for all concerned to say "high pressure to the south of the uk will ocasionally ridge northwards after which some weakish fronts will effect the north and west,slight frost in places"
Take out the frost bit in summer and theres your forecast. Simplistic I know but for 99.9% population who are'nt particularly interested it would suffice and 99% of the time would be accurate. Next week the fresh EC Weeklies (or EC46) run, shows a ridge to the west of the UK for the week's average. 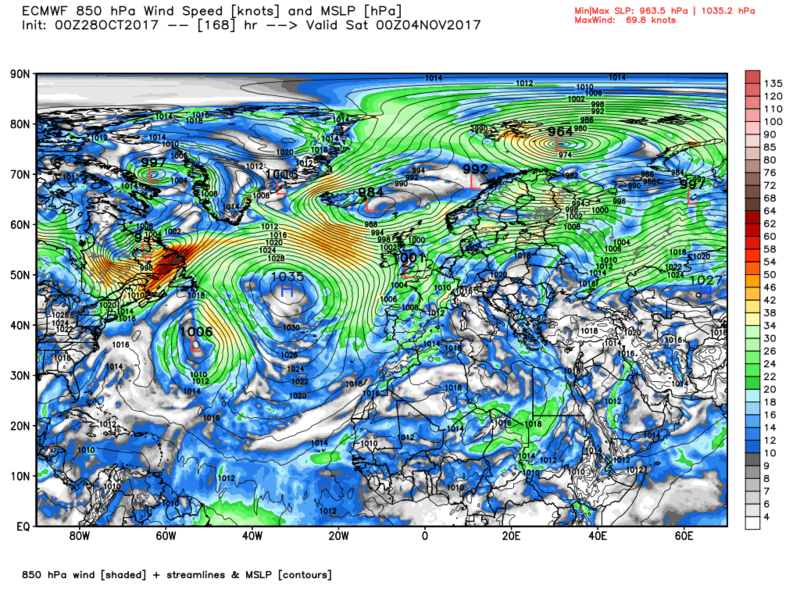 And a trough over most of Eastern Europe, into Russia. Ireland is warmer than average, according to the EC Weeklies model next week, but Great Britain is neutral temperature wise. 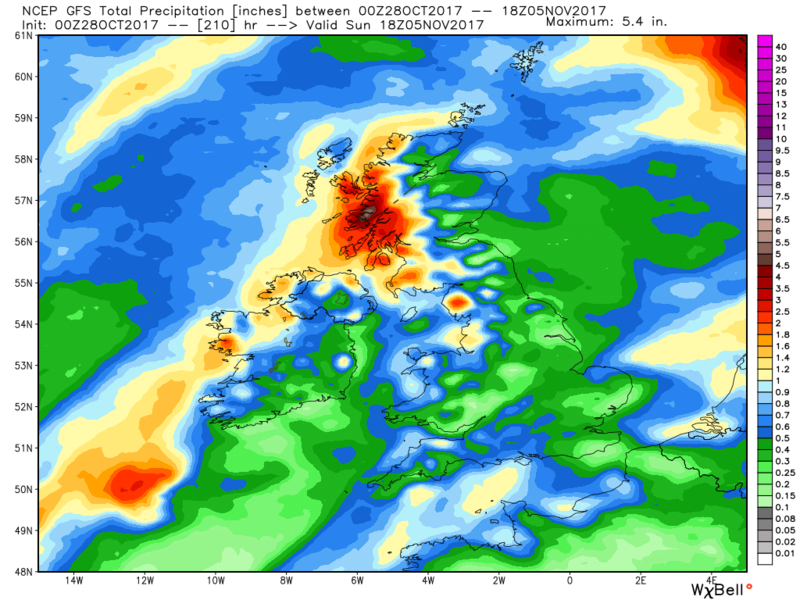 The UK is forecast to be very dry overall next week. 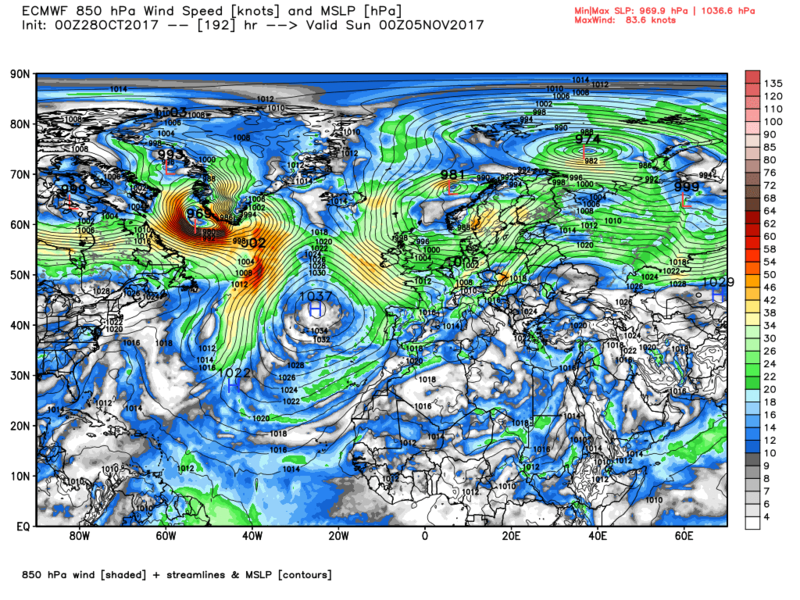 A ridge builds over Scandinavia, moving down to Germany and the UK. 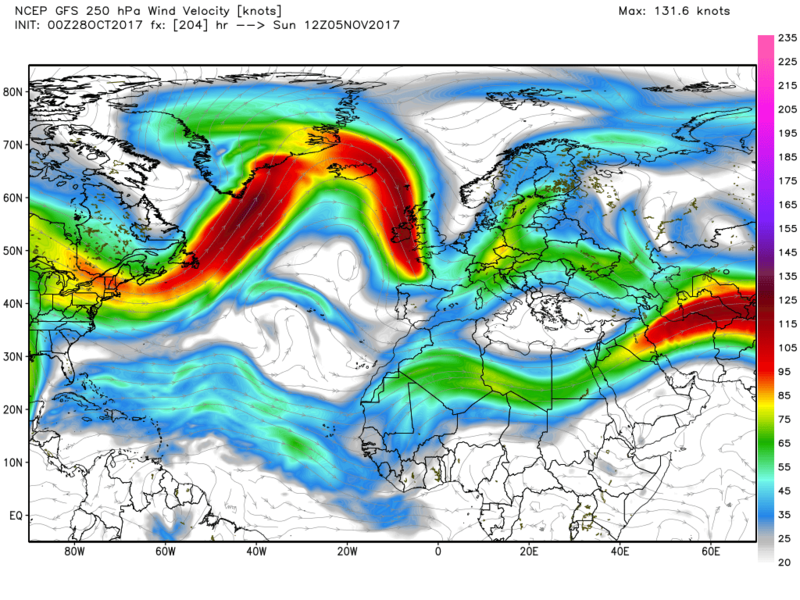 This makes a zonal flow across Europe occur in the jetstream (no northerlies, like the week before(next week)). The temperature outlook is neutral. The precipitation outlook is mostly neutral for the UK, except for wetter anomalies in NW Scotland and drier anomalies in Wales and SW England. A strong Scandi high seems to come this particular week, although the high's strongest point is over Finland and into Russia. This creates a zonal flowing jetstream across the U.K. yet again, though the direction might be slightly ENE. The temperature outlook is once again neutral for the UK. The precipitation outlook is wetter than normal for the majority of the UK, due to what looks to be a strong Atlantic. Then you get a Euro high, centered on the Baltic Sea. It extends across most of Europe, except the Iberian peninsula. However it extends over the UK, and looks to neutralise our precipitation outlook for most of the UK. However the snowfall anomalies in Scotland are lower than normal. 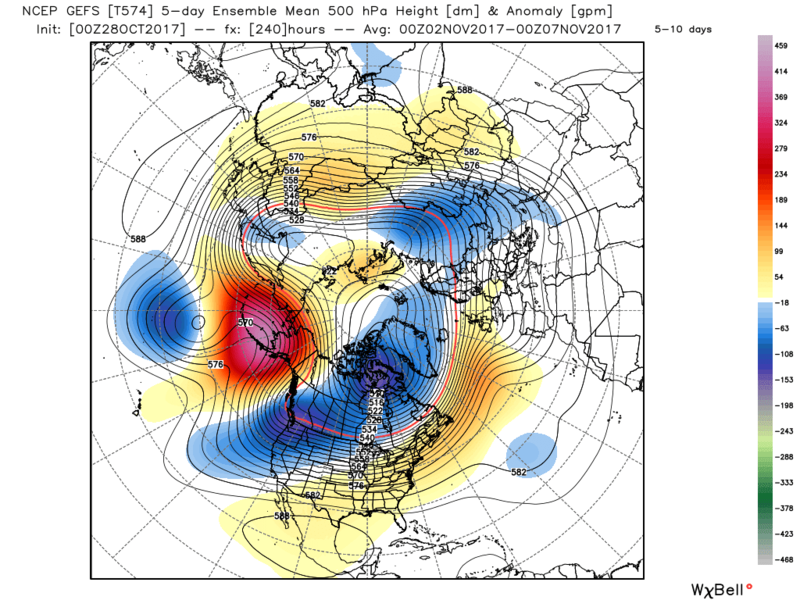 Very interesting run from the EC Monthly model. Hope it was interesting, SubX should be coming out tomorrow, so I will post that data here. Impossible to factor them all in.  They try their best, but we are still refining it. TBH it is pretty amazing what we have achieved.... accurate 5-7 day outlooks of the weather. We are still working to refine longer range forecasts. 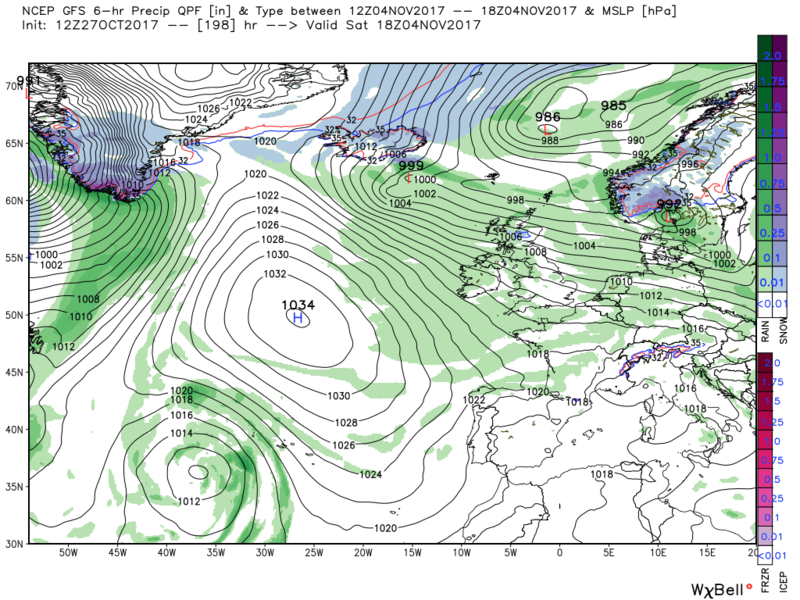 The gfs this evening makes rather more of the wave on the trailing front next Thursday and has it 997mb just NW of Ireland. 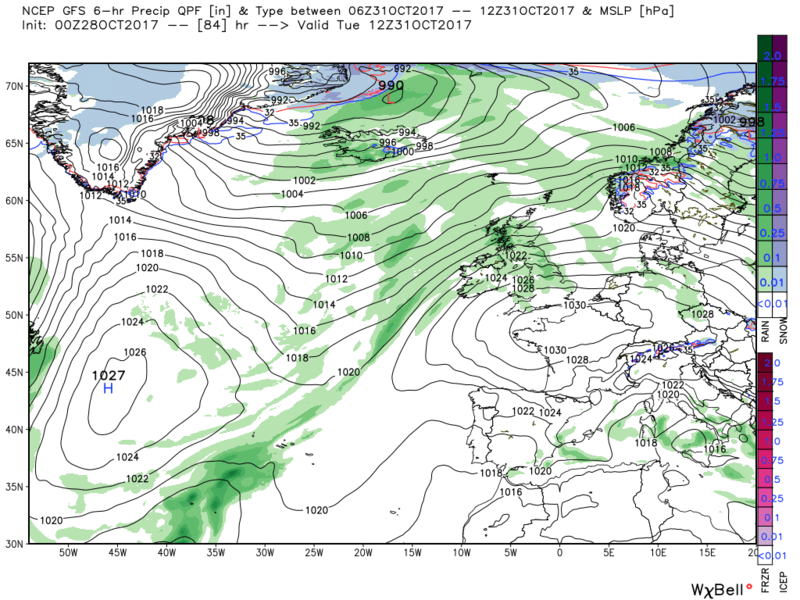 It then runs it east into Scotland, accompanied by rain and quite strong winds, on Friday and it continues on into southern Sweden leaving the UK in a showery NW with a small disturbance south of Iceland waiting to track SE into the UK. This it duly does overnight Saturday and by midday Sunday the SW has veered northerly over the UK and the next ridge is about to nudge in from the west. All, of course, subject to revision. And just to emphasis that nothing is sorted from the middle of next week onwards the ecm takes a different approach to the gfs. 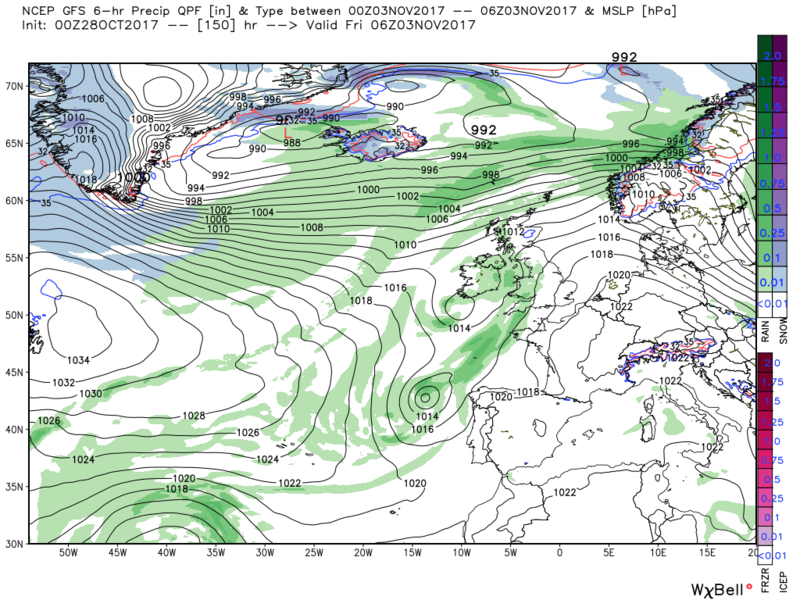 It continues to form a low on the front and has it west of Coruna by 12 Thursday. 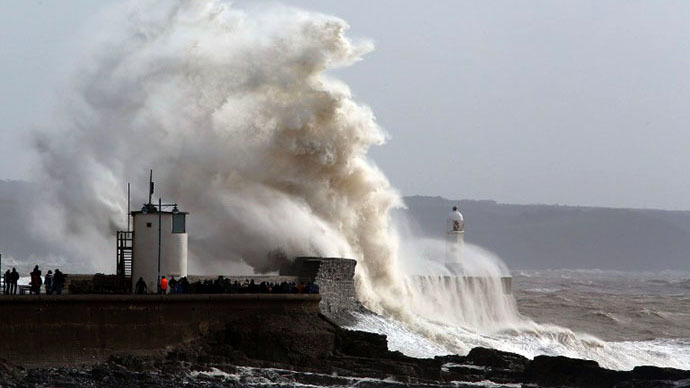 with the high pressure ridging over the top into the UK. But this ridge is quickly shunted south west as the trough to the NW phases with the one to the SSW and by 18 Friday there is a tongue of low pressure and front running from Cornwall to Portugal with rain over the south west whilst the north is in strong WNW airstream courtesy of the large low pressure area to the north The front crosses the southern half of England Saturday morning clearing the east coast by midday leaving the whole of the UK in showery north westerly.as once more the HP ridges in from the south west. Today a fairly quiet day, apart from Scotland where it will be rather windy, with generally a west/east split over the UK. The west will be rather cloudy with perhaps some drizzle in places whilst eastern areas will be less so with more sunny periods and quite warm. Later in the day rain will spread into Scotland as fronts encroach and these will track south overnight and through Sunday introducing cooler air as the surface wind veers northerly. 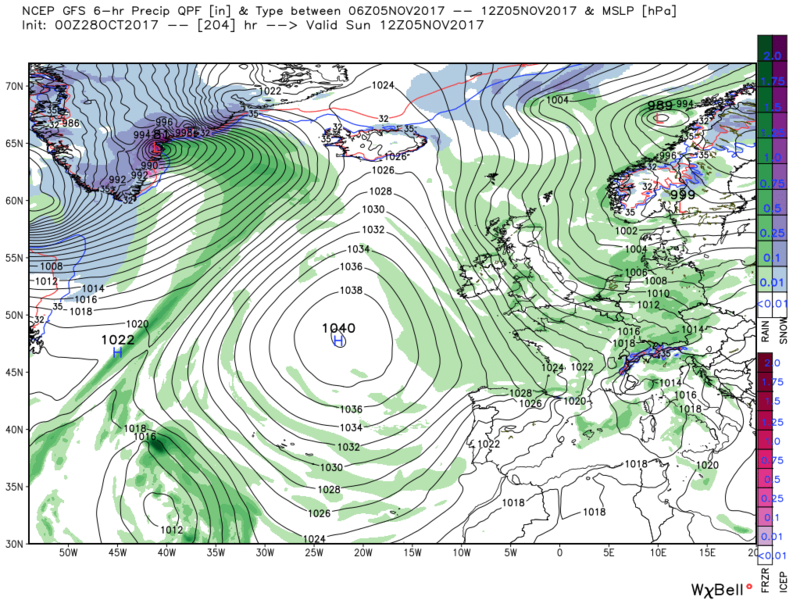 This actually is the main feature of the current analysis as a new intense low has formed in the circulation of the main trough to the east and is 976mb Skagerrak by 00 tonight, This will initiate NW/N gales down the North Sea, perhaps violent storm 11 for a time in places, and 8 or 9 along the east coast of the UK. 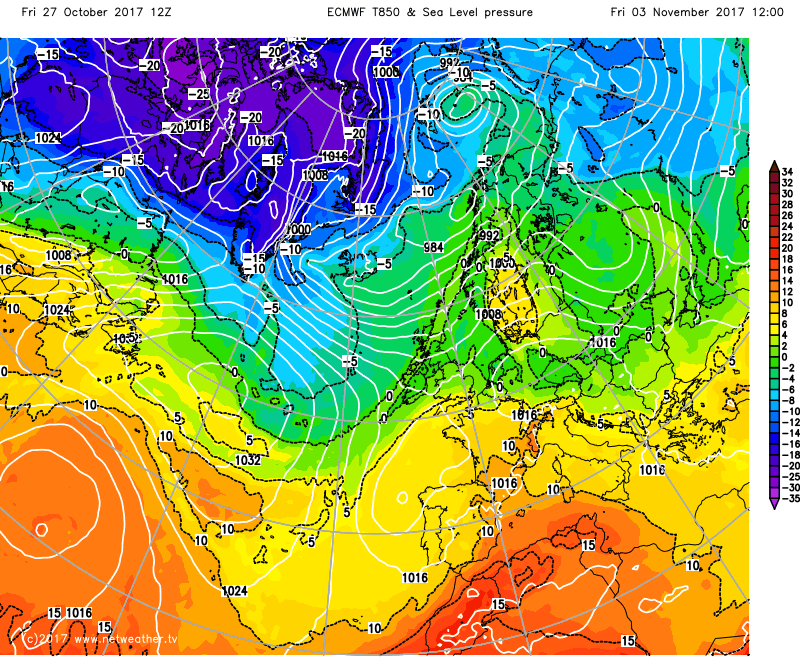 By Monday high pressure has moved in and the evolting still conditions a widespread air frost is on the cards Monday morning. But this quickly comes under pressure from the main trough to the NW/N and associated trough running south in the Atlantic so that by Tuesday front(s) and light rain are tracking south across the country. Albeit finding it a struggle against the high. 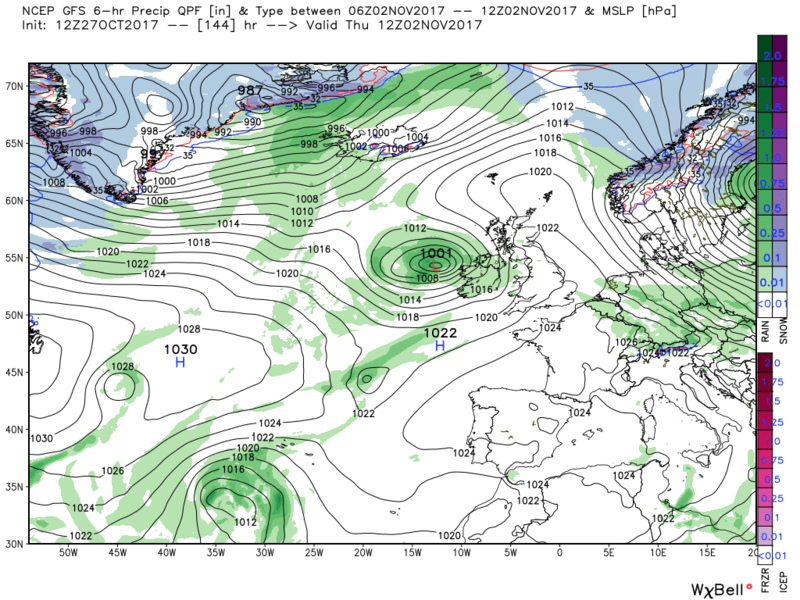 This is more or less repeated on Wednesday as the main low continues east and the trailing front runs from Scotland to points to the south west. From here a scenario evolves that has been hinted at by the anomalies which is a split flow in the eastern Atlantic with the high pressure/trough combination to the south west diverting much of the trough/energy ENE leaving much of the UK in a slack gradient, probably cloudy with patchy rain. But this analysis is very short lived as another amplification bout ensues with the high pressure in the Atlantic once again surging north and the main trough tracking sharply south east just to the east of the UK. Thus by 12 Sunday the surface wind has once again veered northerly introducing much cooler air with showers along the northern and western coasts. Once again one run, one model, subject to revision. And once again it's worth repeating that apart from western Scotland this is a very dry outlook with temps a little above average but dipping below towards the end of the 10 day period. The split flow mentioned above is still apparent on this morning's GEFS anomaly. The ecm still making rather more of the wave on the front at the end of next week and at 00 Saturday has the low over south west England with the band of heavy rain tracking north east into the North Sea during the morning Thereafter it pushes the ridge in a tad quicker before the Atlantic assume dominance by Tuesday. Yes, I was referring to the Pacific ridge and I agree with your thoughts. It doesn't seem to help us in the slightest. 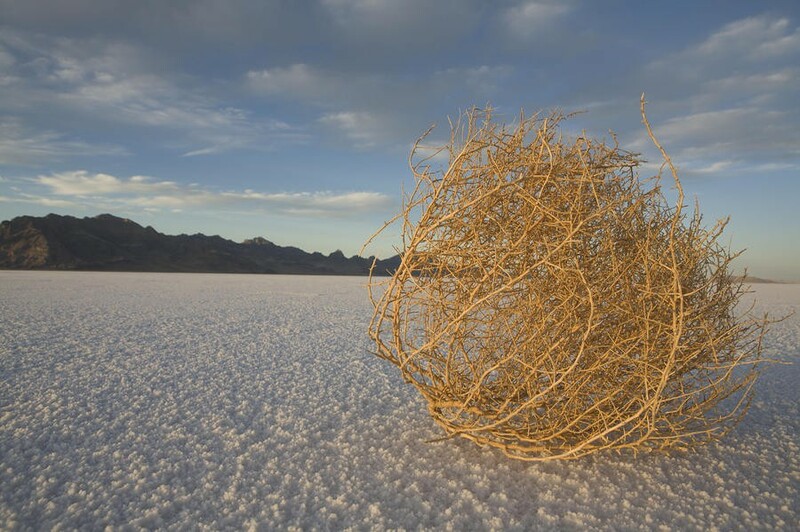 Just returning this thread to a closer time frame but intersting to read the comments about the longer term. 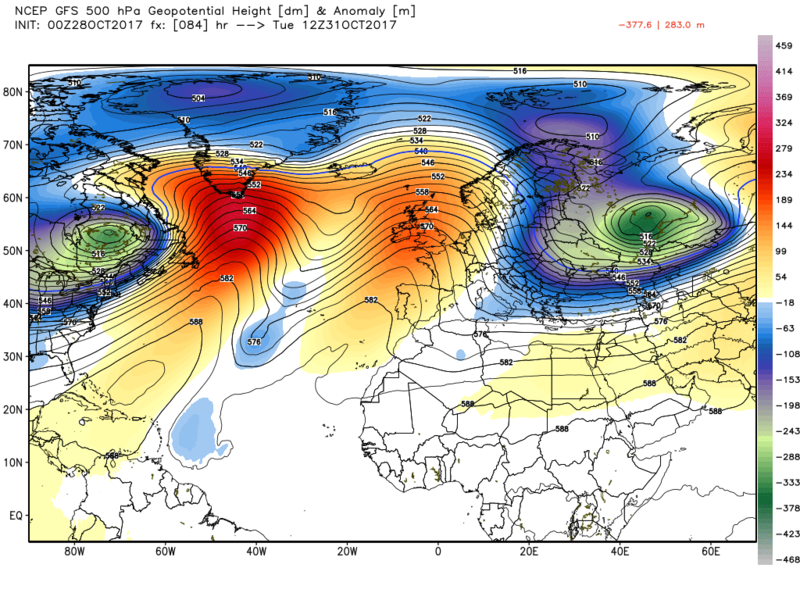 Looking as usual at the 3 500 mb anomaly charts I use and they have gone from a reasonable agreement last Sunday of a ridge west of the UK and troughing over/east of the country to variations with them during the week, suggesting less emphasis on the ridging in the Atlantic and a general westerly idea, back in the lasy 24 hours to the ridge-trough pattern, see below. Both ECMWF and GFS show this but NOAA less so. Perhaps the inference is that our weather will, over the next 6-10 days, largely come from, at 500 mb, north of west not south of west. Faily settled at times but with some more changeable days mixed in as well. Temperatures probably being around or a touch below for most in the same period. sorry there is a repeat below mods can one of you delete it for me please? Yes November looking good. Shots of cold from the north, the continent getting a lot colder, and then that increasingly more southerly jet. Lots to be happy about! Yes the 12 gfs run has my interest with some PM / northerly outbreaks, but it still looks a bit mobile to me .The jet though is tring to dig south, certainly worth keeping an eye on.